– Beetle [type 1] that was also active in rallies all over the world appeared in [MF – 01X chassis] which can play a wide range without choosing on / off road! – Since it was born in 1949, it has a rounded humorous style, air-cooled horizontally opposed 4 cylinder engine with the necessary and sufficient power mounted on the rear, Volkswagen loved around the world with a simple and practical room Beetle (type 1). – Lightweight as well as small exhaust volume, combined with durability and good serviceability to withstand abuse in rough roads, showed active in the world rally from the 1950s to the early 1980s. 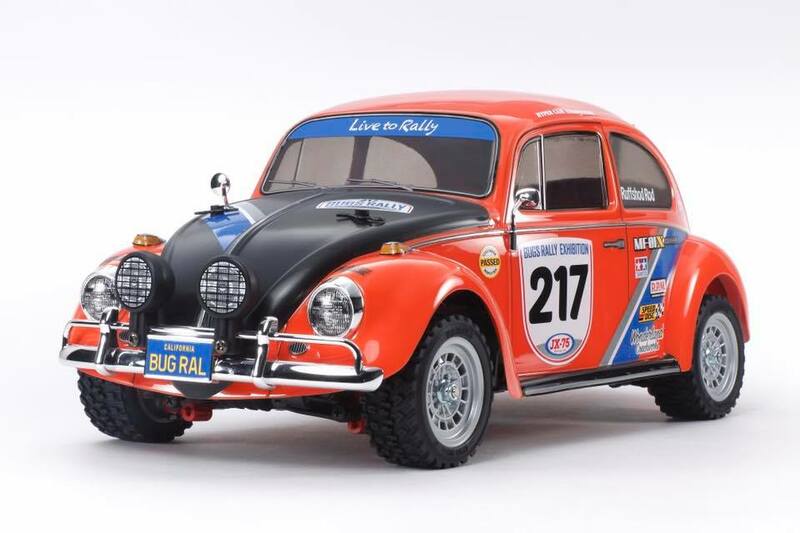 – It is an assembling kit of electric R / C car which finished by imitating Beetle who participated in such a rally. – The body is made of lightweight and strong shock-resistant polycarbonate. We modelled the unique form as detailed as possible, and the front and rear bumpers and door mirrors are reproduced with plated parts. We also set up light pods and stickers to enhance the rally mood. – Compact size 4WD [MF – 01X] enabling you to enjoy running without challenging the road surface from on – road to off – road chassis. – The motor is mounted on the rear end, the gear transmits the power to the rear wheel, and the propeller shaft transmits the power to the front wheel. – The frame is a monocoque type with high strength and left splitting type. We are also pursuing ease of assembly by integrating gear boxes. – Equipped with differential gears in the front and rear closed gear case. – Set a running battery near the center of the car body and the weight balance is also good. – The suspension is a double wishbone with excellent grounding ability independent of four wheels. – A rally block tire with a diameter of 60 mm and a width of 26 mm is installed. – In the main frame of 3 division configuration, three center wheelbases, S, M and L can be selected by exchanging the spacer block in the center and combining optional propeller shafts. The body of M chassis series with plentifully arranged can be mounted.